This year I am extremely excited to be a member of the middle grades panel for the Cybil Awards. Are you ready for the awards?! This year, awards will be given in nine categories (Easy Readers, Fantasy & Science Fiction, Fiction Picture Books, Graphic Novels, Middle Grade Novels, Non-Fiction Middle Grade/Young Adult Books, Non-Fiction Picture Books, Poetry, Young Adult Novels). Anyone can nominate books in these categories (one nomination per person per category). Nominated titles must be published between January 1st and October 15th of this year, and the books must be in English (or bilingual, where one of the languages is English). To nominate titles, visit the Cybils blog between October 1st and 15th . A separate post will be available for each category – simply nominate by commenting on those individual posts. If you are not sure which category to choose for a particular book, a questions thread will also be available. Assessment in Reading Workshop is always difficult, especially in an education culture that begs for grades at every turn. I always struggle with how to assess my readers without cramming quizzes and tests down their throat at every turn. I do test their basic comprehension when we read class novels- a necessary habit/evil that they must practice in order to be able to do it in middle and high school. Plus, I love our class novels! And they should be easy grades for every student, as long as they pay attention to our class discussions. Assessing independent novel reading is a struggle for me. I firmly believe in the Atwell school of thought which states that independent reading is pleasure reading. Therefore, testing or grading that reading is counter-productive because it only makes reading a chore. But of course, we need to give grades. I think I finally have an assessment I am happy with this year. It isn’t the be-all-end-all of my grading, but it does provide me with more data about my students as readers while also giving me a quick 5 points/week in our semester grade. After reading Day-to-Day Assessment in the Reading Workshop: Making Informed Instructional Decisions in Grades 3-6 by Franki Sibberson and Karen Szymusiak I decided to implement a weekly in-class reading log. I used a basic reading log last year which just asked the students to fill in the title, author, number of pages read, and the date. It served its purpose but I wasn’t getting anything from it. This year I implemented Franki and Karen’s weekly reading long instead. This log asks for the title, author, genre, and pages read. But it also asks for a comment on that day’s reading. So we read for 20-30 minutes and when we stop the kids fill in their comment. Sometimes I shape their comment by asking them to use our daily mini-lesson. For example, we were working on thick vs. thin questions this week so I asked them to write a thick or thin question after their reading. At the end of the week they also fill out one thing they learned about themselves as readers that week and a goal for the next week. I have now collected the weekly logs twice and I am thrilled with them! They give me a great picture of my kids and their reading. The comments have been getting better with each day and I love seeing how they think about their thinking at the end of each week. Thank you Franki and Karen for the awesome idea! Very few of my students are familiar with the situation in Northern Ireland over the course of their lifetime. However, this contemporary situation is one that should be taught. 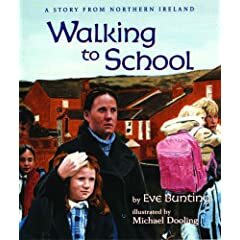 Before I read Eve Bunting’s newest offering, Walking to School, I wasn’t really sure how to do it. Now, I know I will share this story with my students as a read-aloud (and a perfect example of a small moment story/personal narrative). Allison has just started at a new school in Belfast. In fact, she has just started school at the same girl’s primary school that her mother attended at her age. Instead of being excited, though, Allison is dreading school by the second day. Not because of her teacher or classmates or the work. No…she dreads the walk to school because on her first day, Protestants lined the main street and spat the children while yelling and cursing. She is terrified to walk to school again. Her mother enlists her uncle to walk with them, but Allison can’t tell her that she is also scared of Uncle Frank. See, she knows a secret about her uncle that her mother doesn’t even know. And because of that she is afraid of him and this makes walking to school even worse. Of course, Allison’s mother makes her go to school. While the walk is terrifying and even worse than the day before, a momentary connection between Allison and a young Protestant girl changes everything for her. This is a deep story and one I plan to use as a mentor text for personal narrative. I can also see using Walking to School as a picture book for advanced readers because there are so many layers to the story. The possibilities for discussion are almost endless. Eve Bunting has done it again! Jeff Kinney is a godsend for reluctant readers. His Diary of a Wimpy Kid series is my go-to for students who hate reading. Everytime, within only a few pages of Greg Heffley’s “diary” they are laughing and telling their friends what a great book it is. I can’t tell you how many of my students over the past two years list Kinney’s books as their favorites. Jeff Kinney has truly written “gateway books”. My kids start with the middle school adventures of Greg Heffley and then move into other novels, exploring new genres and authors, thanks to Diary of a Wimpy Kid! Now, Jeff Kinney is looking to do the same for reluctant writers. His latest venture is Diary of a Wimpy Kid Do-It-Yourself Book. Designed just like the other Diary of a Wimpy Kid books, this hardcover (orange!) book includes original art, writing prompts, and do-it-yourself comics. Greg leads the writer/reader through a variety of silly and funny writing ideas. Some of my favorites include rules for your family, the baddest thing you ever did as a little kid, and a few questions from Rowley (Greg’s best friend). The entire book is written in Greg’s authentic middle schooler voice, and the book reads like a conversation. I found myself laughing out loud more than once! I really enjoyed this book. It is available in the October Scholastic catalog and a few of my students already mentioned they can’t wait to order it. If Jeff can hook kids into reading as well as he hooks them into writing, I will love him even more! Miscellaneous Thoughts- I love the orange color of the cover! I also love that Amulet printed this as a hardback instead of a paperback. Kids are going to love the idea that their book truly is a Wimpy Kid book and not just a lame knockoff, because it is a real hardcover, too. Small details like that are so important when you are trying to get kids to enjoy writing. I am the crazy butterfly lady, no doubt about it. If a book so much as even mentions monarch butterflies I must have it for my classroom collection. Imagine my excitement when I received a review copy of Houdini the Amazing Caterpillar from Clarion Books this week! 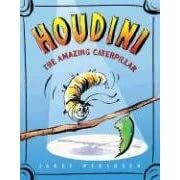 Houdini is a monarch caterpillar who lives in a classroom. He is always the center of attention due to his amazing tricks, like eating milkweed leaves really fast and shedding his skin. The kids love him! But one day, they start paying attention to other animals in the classroom, like their pet turtle. Houdini is not thrilled with this new development (especially since he thinks the turtle is B-O-R-I-N-G). He tries to perform new, more amazing tricks but nothing holds their attention. The day that Houdini decides to pull out all the stops and shed his skin on last fabulous time. This time? He becomes a chrysalis! The students are in awe after viewing this last transformation and Houdini is one more the center of attention. He goes two weeks without moving, eating, or doing any other tricks! Finally, after 10-12 days he opens his eyes and emerges from the chrysalis. This amazing feat stuns the children, who are thrilled with their friend, Houdini! Now that he is a beautiful monarch butterfly, they hold a butterfly release and let him go. This is a very cute book and one that rings very true for me. We just did our last monarch release a week ago and even my 6th graders are excited about the metamorphosis of the monarch butterfly. The book is very accurate and includes all the stages of the life cycle. The illustrations, watercolors done my Janet Pedersen, are gorgeous. The only small issue I have is that Houdini is more white/yellow striped than black/white/yellow striped. However, this is my only quibble with the book. Janet Pedersen was inspired to write Houdini the Amazing Caterpillar after attending her son’s kindergarten butterfly release. How cool is that?! I hope that kindergarten teacher is as excited as I am! Pedersen also includes a page of monarch facts in the back, which makes me happy. This is a great book for any classroom that raises monarchs. It is also great for teachers and parents who don’t have monarchs of their own but want to share these magical creatures with their children. I highly recommend it! I spent little bit of time tonight playing with Jogtheweb. Jogtheweb allows you to create tracks, or trails, on the internet. Tracks lead readers from one sight to the next. You can set up any type of track you can imagine and I can see this being a great resource for research or web quests. I set up my first track tonight. My topic? Author blogs and websites, of course. I chose 11 websites/blogs run by middle grade authors and set them up in alphabetical order. I then posted the track to my class blog, where I hope the kids will take a few minutes to get exposed to the “real” writers out there. I think it is so important for them to see that writers struggle with writing, post funny pictures, and have lives outside of writing. Hopefully it inspires them that they can also be “real writers”. And even better? It might inspire them to pick up a book that author wrote or recommended! My Author Track can be found here. Thanks to Jen for the link to National Punctuation Day! I think I am going to change my plans for tomorrow and have some fun with punctuation! I plan on printing (part of) the press release for our do-now and asking the students to add some of the missing punctuation. And I imagine showing some of the incorrectly punctuated signs could start some great conversations.